Do you know what to do when disaster strikes? When you are traveling and someone falls while hiking. Will you be prepared? Ok, so it’s probably not that dramatic. I feel that anyone that spends any amount of time in a car needs to have a solid DIY Vehicle First Aid Kit. First aid kits should be a necessity in all cars. If you break down on the side of the road, or if you have a bump and scrape at the park. It’s just smart to have a first aid kit for your car. Why Make your own DIY Vehicle First Aid Kit? It’s a good idea to have a first-aid kit in the car in case of bee stings, trips and falls or any other road side emergency. I liked the bag option because it would keep everything organize. In my case, I don’t have needles or anything that needs extra protection, so I prefer the more flexibility soft sided bags. If you need extra protection for items inside, use a hard sided plastic case. They have the pre-made kits available but most people just throw it in their car and don’t even look at what’s inside. Building your own lets you determine what could be valuable to your family. Also in an emergency, you will know what’s in it and where to find it. You don’t have to buy a lot of the fancy equipment. But you also want to include a little more than just band aids. 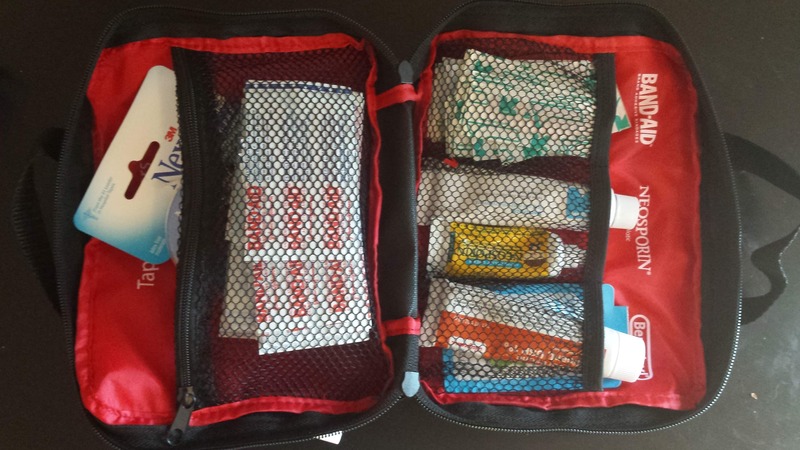 A DIY Vehicle First Aid Kit starts with a good bag. I picked mine up on Amazon. They sell them in a three pack which I highly encourage getting. That way you can create 3 identical kits and keep them in each car, home, a backpack, camper or one at home. The bag needs to have a few compartments to help you keep everything safe and easy to get to in an emergency. It also helps that it lays down flat making it easy to sort through. I also recommend any medications or common over the counter medicines that you use. Things like antacids, allergy medicines, feminine products can also be added. Also consider a small thing of sunblock or lip balm. Looking at the list, it looks like it could cost an arm and a leg. But it really doesn’t have to. Start out first at the Dollar Tree and see what’s available. Depending on your purchase, you may be able to split things up between multiple bags. Bandages and gauze for instance can be purchased in boxes of different sizes and split. The Dollar Tree also have burn creams and anti inch creams that will work great for bug bites. For those items that you can’t buy at Dollar Tree, visit big box store and get the rest of the stuff. Depending on coupons and discounts, Target may end up being cheaper for some items. For the longest time, I’d bring my first aid kit with me where ever I went and it seemed kind of silly. But when were were heading into New Orleans when a hurricane was supposed to hit, I just threw it into my suite case without a second thought. When I’d take the kids to Disney, it was there. I brought it religiously with me everywhere. But when we went to the San Diego Zoo, almost two years after carrying it around with me everywhere, my daughter got stung by a bee, it was there. The simple things like a pair of tweezers and a little burn cream was just what we needed to stop a full blown day ending drama. I never leave home without it now.